Until the latter part of the 16th century in England, window curtains were virtually non-existent. Instead, internal wooden shutters were used to keep out light and cold. When curtains did finally make an appearance, they were made from one piece of fabric hung on an iron rod from iron rings sewn onto the fabric, and drawn from one side of the window only. Drapery was, however, used to partition off parts of the great hall in which the lives of the large households centred. The hangings would be both decorative and practical; they were very useful in reducing the draughts of the chilly English weather. These hangings were suspended by rings on rods attached to the walls or to columns. Wall hangings were also popular as both decoration and for going some way to keeping out the chill of the cold stone walls. Curtains over doors were more common than window curtains, and were frequently made from tapestry to match the wall hangings and give some decorative cohesion to the room. French and Italian curtains during this period were rather more elaborate, made from velvet or brocade and hung in pairs. The bed was the most important piece of furniture in the household, so much so that it was considered a symbol of the wealth and status of the owner. The bed was usually low, and the earliest draperies were held up on rods stretched across the room by cords which were attached to hooks imbedded in the ceiling. This later evolved into a canopy which was supported by a headboard and corner posts. The bed curtains were usually made of expensive imported fabrics like tapestry, rich velvet or brocatelle (a type of silk strengthened with linen). The curtains were drawn up into bags suspended from the corners of the bed when not in use during the day. In France bed drapery was quite sophisticated in the 16th century, drawing its inspiration from the antique drapery in churches. The valances were shaped, fringed, tasselled and ornamented. The draperies were frequently rich and extravagant, with patterns in gold on black or red velvet. Beautiful silk velvets had been produced in Italy since the 14th century, but by the 15th century the Italians found themselves competing with the French in the production of these exquisite fabrics. Asymmetrical patterns replaced symmetrical patterns during the early part of the Renaissance, with pictures showing movement becoming popular, e.g., floral scrolls, birds in flight and running animals. Damask was a favourite material of the period. Although traditionally made of silk or linen, damask was also woven in wool or a mix of fibres. Linen damask evolved when the Flemish linen-thread weavers of Bruges copied the patterns of the Italian silk damask in linen thread. Italian and Flemish weavers were established at Fontainebleau to weave intricate tapestries, and in Lyons to produce silk. Silk was woven in England from the early 1400s, but only the wealthiest households could afford it, so wool and linen remained the fabrics of popular choice. The first indiennes - brightly coloured hand-blocked and hand-painted calicoes which were colourfast - were introduced into France from India at the end of the 16th century, and were immediately popular. As dyeing techniques spread into the West from the East, the colouring of fabrics improved, although European block-printing techniques remained crude for some time. Ropes and tassels in a variety of shapes and sizes were used to hold back bed curtains, and add decorative effect to bed pelmets and portieres (door curtains). The pelmets were often decorated with embroidery appliquéd onto the surface of the fabric. Lace was also used as an edging material. Window curtains were still rare in 17th century England, normally found only in important rooms in grand homes. Shutters were often used on the first and second floor windows of townhouses for privacy. Keeping out the cold was a constant worry, so that sometimes special window cloths were hooked into the window recess at night in order to keep out the draughts. Paired curtains remained rare until the end of the century, when the architectural styles of the windows demanded a symmetrical effect. By the late 1670s all the principal rooms at Ham House had been fitted with them. Curtains were certainly not as lavish as bed hangings, and were often made of sarsnet, a thin silk taffeta in the grander houses, and a dark worsted wool in simpler homes. Daniel Marot, a French Huguenot brought over to England by William and Mary, had a great influence on interior design during their reign. He liked to impose unity in a room, and his engraving were greatly influential. One favourite style involved using portieres en suite with wall hangings, which was both decorative and functional as it excluded draughts. Portieres were often combined with flat, shaped, stiffened pelmets called lambrequins. A major innovation was pull-up curtains; curtains which were pulled up by cords to hang in festoons or swags. Usually made of silk, they were unlined, and hung flat against the window when they were pulled down. Hanging curtains were still in use, however, and pelmets and valances were introduced. Stiffened, shaped and ornamented pelmets were highly fashionable, and were usually trimmed with tassels for definition. White silk blinds began to be used in the grander houses from the middle of the century in order to protect the interiors from the full force of the sun. Holland matting and unlined Indian calico were also used for this purpose. White damask blinds shot with gold thread were used at Versailles, and later in the century the French introduced external slatted blinds. Sashes were also used as a sunblind. The fabric was stretched on a wooden frame and soaked in oil or turpentine for a translucent look. They were tinted a dark colour and frequently decorated with paint. Beds remained a symbol of the wealth and status of the owner. The beds known as French beds had a simple wooden framework which would be completely covered with hangings. There was no cornice, and the curtains hung straight down from the rails, held in place with nails. Domed testers (lits a la duchesse) were actually half-testers, with a “flying” canopy suspended over the head of the bed by cords attached to the ceiling. Daybeds were fashionable in both France and England, and could be used with canopies enriched with gold lace, pearls an gold embroidery, as well as plumes and gilded sculptured cornices. Beds were growing taller and the French influence was evident in the sumptuous fabrics and trimmings used in the hangings. The number of curtains used for bed hangings was either two, four or six. Fabric was customarily hung below the top rail of a tester bed - this became known as a “valance”, a term now also applied to any softly pleated pelmet. The hangings and valances were richly decorated with crewelwork or embroidery and often lined in a contrasting colour. Turned knobs were often fitted above the tester and could be carved, gilded or covered with fabric and trimmed. Feathers or ostrich plumes, or small bouquets of silk or metal flowers could also cap the tester. Beds, curtains and chairs were all decorated “en suite” (in the same fabric). Fabric was sometimes simply draped around the bedposts as an alternative to curtains, although this would not have kept the occupant as warm as hanging curtains. In England, a large range of fabrics imported from France, Italy and Flanders was available. The simpler fabrics included tickings, linen, and sackcloth. Cotton and needlepoint was regularly used for upholstery. Indiennes were initially used as table carpets and stool covers, and later as curtains, bed and wall hangings and bed covers. By the middle of the 17th century the first Provencal prints were produced by printing with wooden blocks onto cotton. Damasks of silk, linen or wool were still much in favour, and silks of all types abounded. The French particularly favoured heavy taffetas and moires. The silk industry in England was developed by French and Dutch weavers and advanced by the Huguenot refugees from France. Spitalfields became the main British centre for silk damasks and brocades. Expensive, bold-pattered Genoa velvets, and gaufrage velvets with the pattern stamped on with heated metal were top of the range fabrics. Brocatelle and tapestry were primarily used for wall hangings, which could alternatively be printed, painted or flocked. Leather was widely used for wall hangings and chair coverings. It was frequently embossed with a wooden mould or punched with small patterns, then the main part of the pattern would be painted, and the unpainted sections varnished resulting in a gilded effect. Seventeenth century trimmings, which were made primarily in wool, silk and linen, had clean lines and became increasingly delicate and complex as the century progressed. Trimmings exhibited a variety of effects and clever combinations. There were velour braids decorated with stylised flowers, fringes with braided tops, and campaign fringe with bell-like tufts. Most tie-backs were of rope cord with tassels for definition. Shutters were still widely used in the early part of the 18th century. Pull-ups, fuller and more ornate than in the previous century, were still popular. They were usually made of light fabrics such as taffeta or cotton chintz, but occasionally velvet was used. The workings were usually hidden by a pelmet cornice and valance. Paired curtains were in use, topped with elegantly shaped and stiffened pelmets with appliqué or embroidery work. The fabric often included Rococo motifs such as garlands of flowers, knots of ribbons and fronds of leaves. By the mid-18th century, pelmets had softened, with shallow swagging and small tails and bells. Portieres had deeper pelmets and lighter curtains, caught back three-quarters of the way up in the “Italian” style. Light silk festoons (called store marquise) were used with draped pelmets. Roller blinds appeared during this time - their first recorded use in London is in 1726. In France it became fashionable to place beds in alcoves, but in England the four-poster still enjoyed the height of popularity. The alcoves were usually decorated with lambrequins and side curtains held back with rope cord or rosettes. The lit a la turque was introduced. Placed parallel to the wall, it had a small canopy or half-tester above supporting drapery which hung over each end of the bed. Another new bed style, the lit a la polonaise, named after Louis XV’s Polish queen, was roofed by a dome held in place by rods from the four corners of the bed or from brackets attached to the wall behind. Bed hangings were lighter, simpler and more elegant. Valances and bedcovers were cut in elegant shapes, and often had raised appliquéd trimming rather than fringing. There was a huge range of sophisticated fabrics from which to choose in the 18th century. The silk industry was thriving, with scallop, lace and fragile floral patterns and patterns incorporating turtle-doves appearing. Silk was the most used fabric in grand interiors, with linen used for beds, tables, linings and inner covers. Bed hangings were usually of silk or rich Genoese silk velvet. For windows, silk damasks and brocades were used, sometimes shot with gold thread. Brocatelle was still used for hangings. Satin, taffeta, ribbed silk, clouded silk, and chintz were all used for curtains. Simpler homes would have used woollen fabrics like serge and moreen for beds and draperies, and leather, silk mohair and velvet for chair coverings. By the end of the 17th century, European printworks had been established to blockprint imitations of the indiennes (also called chints from the Hindu word for “speckled”) imported from India by the Dutch, English and French East India Companies. The finest chintz was produced at Jouy-en-Josas near Versailles. But for most of the 18th century in France and England, “anti-cloth laws” aimed at protecting the woollen and silk industries held the textile-printing industry back. Not until the 1770s did production get into full swing. A wide range of sophisticated trimmings could be found in England, Ireland, Germany, Switzerland and the Netherlands in the 18th century, as a result of the flight of the Huguenot craftsmen from France in the late 1600s. Broad and narrow bands of gold-coloured lace were applied to a hanging in a rich, contrasting colour in a new technique. Also, use of raised detailing such as gold galloon, frogging or artificial flowers as a trim on pelmets and valances replaced the heavy trim of the previous century. Tie-backs, embroidered or appliquéd and finished with bows and ribbons or tassels, became a feature in their own right. In late 18th century England, simple, straight curtains were still widely used, often tacked straight onto the window frame. The new fuller pull-ups were also popular, especially when topped with a pelmet cornice. The carved wooden cornices of Thomas Chippendale and Thomas Sheraton were a feature of the period. A major innovation was the introduction of a full cord-and-pulley system (often called French rods) to open and close draw-curtains. An overlap where the curtains met in the centre gave a much better finish. By the 1780s it became fashionable for these French-rod curtains to have draperies or pelmets attached above the window to hide the workings, and the operating cords often had tasselled ends. Muslin subcurtains were frequently installed to protect furnishings from the effects of strong sunlight. Green-painted spring roller blinds were sometimes used in conjunction with straight or drapery curtains. Screens similar to sashes were sometimes fitted to the bottom half of the window and painted green to give privacy. Reefed curtains (sometimes called Italian-strung curtains), which pulled up and apart by means of diagonally strung cords, while the heading remained fixed, were fashionable. Drapery was the most fashionable type of curtaining in the Neoclassical period. It consisted of several pieces of fabric put together to give the appearance of one flowing piece. One or more swags would normally go at each end, with the joins disguised by trimming. Swags and tails often had contrasting lining such as crimson velvet against oyster silk. To soften the outlines of the window and diffuse the light, they were frequently combined with dress curtains instead of full working curtains. Irregular drapery, in which swags were attached at different heights, was also used at this time. They gave a lighter feel than straight swags. Swags were sometimes used as a supplementary decoration to a cornice or pair of curtains. They would seem to be attached, but were actually laid over the curtains and attached to the cornice. In the 1790s Sheraton designed light, elegant curtains, caught back with rope tie-backs, ornamented with rosettes and topped with a cornice and valance which had been softened with the attachment of swags and mini-tails. Draperies in France were light and fanciful, often in pale tones of grey and lilac. Window pelmets were frequently castellated and combined with Italian-style curtains and under-curtains. Swags were shallow and regular, when they were used at all. Curtain ornaments were wide and varied, including wreaths, tassels, bows, and feathers. Much was Classically inspired. During the Revolutionary period in France, symmetry began to be abandoned, but well-balanced and not opulent. In Italy Venetian blinds were now being used and by 1760 these had reached England. In France they were called jalousie a la parisienne. From the middle of the 18th century, as the designing of beds passed from the domain of the upholsterer to the cabinet maker, the hangings became of secondary importance. One of the most important features was an elaborate cornice which was often repeated with the window curtains. With the vogue for chinoiserie, windows and beds were frequently hung en suite with Chinese silk or embroidered fabrics featuring Oriental motifs. Copperplate-printed toiles were also in use from 1760. Velvet hangings with gold fringings were still popular, and, in America, some of the most beautiful beds were adorned with crewel work. Scalloped bed valances were fashionable, and some bed curtains pulled up on a cord-and-ring system to give a double festoon. In the 1790s Thomas Sheraton created several unusual beds. One example was a curved-ended bed, set in an alcove, on a raised dais, the outline softened by swags with tasselled ends. The bed curtains fell from a central corona and were caught back on cloak pins at each end of the bed. Sheraton’s Duchesse beds were lighter and more informal than their French counterparts, the lits a la duchesse. The bedheads were formed like the back of a chair and the full tester was attached to the wall, with the drapery falling in swags and tails to the floor. The centre of the tester was dressed with plumes and the frame swagged. One of Robert Adam’s innovations was the use of window and upholstery fabrics that were the same or similar in colour. The British silk industry was at its height, although painted silks were imported from China. Lyons still produced magnificent fabrics. As the Revolution approached, there was a return to Classical themes including acanthus, lozenges, medallions, festoons and vases. Copperplate printing was developed at this time, making larger repeats and better definition possible in the printing of cottons. The first toile, actually printed in Ireland and not in Jouy in France, was printed using this method. Printed in single colours on an off-white ground, the toiles featured finely etched Neoclassical motifs (rustic scenes, ancient buildings, etc.) The fabric was repeatedly washed and bleached and passed through rollers to achieve the soft, worn look which was popular. Ikats from the Far East in silk and cotton began to be imported at the end of the century. Muslin was now imported from Switzerland. Glazed chintz was also introduced at this time. British craftsmen at Spitalfields copied the patterns of the expensive imported Kashmiri shawls. From the 1780s Paisley in Scotland became the main centre for producing these Kashmir-inspired products, giving its name to the “paisley” patterns. England also imported checked and striped cottons from India. Motifs such as bouquets, ribbons, wreaths, garlands or birds were used on fabrics, and Oriental fabrics remained popular. Embroidered textiles were still much in use, and a wood-and-goathair mix called camlet was highly sought after in England. Loose covers in cotton or linen were widely used to protect furniture upholstered in expensive fabrics. There was an abundance of ornamentation in the 18th century. Most trimmings were made of silk - violet, yellow and brown were fashionable colours. Braids were decorated with stylised floral motifs or were bobbled or decorated with appliquéd bows, rosettes or butterfly shapes. Picot or gimp braids were used as a top for plain, fluffy, spiral or bullion fringes. An alternative heading was a delicate trellis of lace. Mid-18th century tassels had smaller, arrow-shaped or rectangular heads. A trimming of appliquéd bows on the skirt as well as the head of the tassel was popular. By the end of the century tassels were smaller and had plaited tops. Macaroons were circular trimmings used to give definition on tie-backs or in conjunction with tassels. They would be covered in satin and trimmed with braid, and carried appliqué work or boucle knots. Tie-backs were also covered in satin and tasselled, and frequently edged with braid. A slimmer, draped look using pairs of curtains replaced the pull-up curtain which proved too bulky for the taller, narrower windows of the early 19th century. The new window treatments were built up in layers. They were usually hung from poles which could be suspended from a curtain cornice to give architectural impact. Rods or poles were usually highly decorative, with ornaments such as laurel wreaths and rosettes. Where curtain cornices were not used, there was instead a draped heading above the main curtains with loops, swags or festoons. The main curtains were usually floor-length or trailing on the floor, and were caught back by cords or cloak pins during the day to keep them out of the way. The curtains were normally lighter in colour than the walls. Under-curtains were extremely popular. They were made of a lightweight fabric such as silk or muslin with delicate fringing or a wide border in contrasting colours such as dark green, yellow or white. They were generally fixed to one side of the window, but were sometimes drawn to protect the interiors from sunlight. Trimmings were heavy to ensure the curtains hung well. A blind would usually complete the treatment. These included roller blinds, slatted blinds, chintz blinds and updated forms of sashes. They often carried Gothic revival, chinoiserie or heraldic patterns, or was made in a material that matched the curtains to complement the treatment when it was pulled down. External blinds were coming into fashion, made either from canvas or were frame-and-lath blinds with slats. By the 1820s, continuous drapery had been introduced to link two or more windows on one wall and the decoration of the pole became an even more important feature. This could be moulded, painted or gilded. These curtains were caught back on rosettes or cloakpins during the day, and were often lined in contrasting fabric. Continuous drapery was sometimes used in conjunction with ceiling drapery for a tented effect. Scarf drapery in different fabrics and contrasting colours became popular in the French Restauration period following Napoleon’s abdication in 1814. Walls were elaborately draped and curtains were thick and heavy with elaborate trimmings. In Biedermeier interiors, window treatments were kept simple to allow in as much light as possible. One popular treatment was the use of asymmetrically draped sheers trimmed with tassels and fringes. Bed drapery was much simpler than in earlier periods. Typical of the period was the French Empire method of placing the bed along the wall with a centrally mounted canopy supporting curtains or draperies that trailed over the curved ends of the bed. The lit bateau was typical of Empire beds. It often had swan’s head scroll ends. Even cradles were elaborately draped. Egyptian, Gothic revival and chinoiserie styles all influenced bed treatments at this time. Drapes could still be luxurious and were usually covered and lined with contrasting or toning fabric. The rear bed curtain was frequently arranged in a sunburst pattern, with the ceiling of the canopy executed in the same way. The highly improved dyeing and printing techniques of the early 19th century resulted in more realistic colours for floral representations, as well as in vastly reduced prices as textiles were produced in bulk. This resulted in the decline of Britain’s silk industry. Elaborate brocaded silks were no longer fashionable, although other silks were still popular, as were tulle, lustrous taffeta, velvets, damasks, satin, printed linen, sprigged muslin and printed cotton chintz. Pattern and texture were important, as was merino wool, Manchester velvets (cottons with small patterns stamped on them), machine-pressed watered fabrics, geometric and architectural designs, trellis patterns, columns and stripes. Fabrics featuring Chinese motifs were once again in vogue, having faded away at the end of the 18th century. Motifs on fabrics were popular, especially in France, and featured Napoleonic bees, swans, laurel wreaths, crowns, lyres, vases, eagles, and oak leaves. When the monarchy was restored in France, Empire ornaments on fabrics were altered, with the Fleur-de-lis replacing the Napoleonic bees. Trimmings were strong, rich and varied, and gave weight and balance to the furniture and the complex window treatments. The trimmings for curtains grew heavier. There was a wide variety of fringing, much of it delicate and knotted. Braids were delicate and used against a contrasting colour. Bronze and gilt rosettes, discs and cloakpins, used to hold back the curtains, became increasingly decorative. Plain fabrics were enhanced by the addition of contrasting linings and appliquéd or painted borders. There was a proliferation of styles and revivals in Victorian interiors. One could find a “Gothic revival” portiere with a “neo-Rococo” lambrequin. Curtains were generally hung from poles, and swags and tails were used liberally. In drawing rooms the curtains were often dress curtains (designed not to be drawn across the window) tied back on rosette-headed pins with sheers underneath. Decorative finials on the poles were an important part of the treatment. Everything was fringed, braided and bobbled. The light was sometimes kept out altogether by the use of blinds. These were usually made of Holland linen (a type of canvas). Blinds were sometimes painted, bordered or self-patterned and trimmed with fringes or borders. The lambrequin made a reappearance, the Victorian version being a flat pelmet with a shaped outline which continued down the side of the window, sometimes to the floor. It was originally intended to hide the bunches of fabric formed when a pull-up curtain was drawn above the window, but it soon became a treatment in its own right. It could be combined with symmetrical main curtains, and often also had an asymmetrical muslin curtain, caught back with different tie-backs. By the end of the century they were out of fashion, however, as they cut out too much light. Carefully pleated curtain headings were still not common by the end of the century. However, it became fashionable for valances to have vertical pleats extending the depth of the valance or pelmet; these were used as an alternative to swags and tails. Goblet pleats were cup-shaped and padded. Draped pelmets or valances would have been used where a flat lambrequin or pelmet would have been too severe. Swags and tails were used on many bay windows of the period as they covered many awkward corners. Scarf drapery, where one piece of fabric is draped to make a heading for a treatment, became fashionable. The Art Nouveau influence was apparent in the elaborate, asymmetrically arranged festoons. Pelmets were seen in a variety of styles, including Grecian, Gothic, Elizabethan, Moorish and Louis XIV. By mid-century, stamped brass or richly gilded pelmet cornices were often placed on top of the fabric pelmets. Muslin curtains were still used to exclude insects and soften the light. White curtains were in vogue, and white cotton dimity was used extensively for bed curtains and counterpanes. Portieres became popular, and were often double-sided, so that each fabric would harmonise with the colour scheme of the room it faced. Appliqué or embroidery were often used to divide them into the horizontal bands corresponding to the frieze, infill and dado of the adjacent walls. 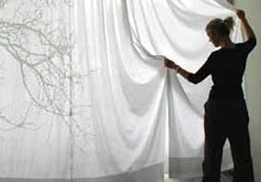 In France, there were so many different styles of curtain that it was impossible to establish a characteristic one. Fabrics were draped over everything. Pelmets were shaped or deeply swagged. There were romantic curtains in tulle, muslin or dentelle frilled, beribboned, or “empearled”. Goblet pleats were used a great deal for the pelmets or portieres and stair curtains. There were curtains with heavy lambrequins, and there were liberal interpretations of other earlier styles. Health and hygiene became one of the major concerns in the latter part of the 19th century, and heavy bed drapery came to be seen as unhealthy. Simplicity was the key to Arts and Crafts beds, with the emphasis on the quality of fabric design. Plain cornice boxes in wood, painted or covered with a simple stiffened pelmet, were used with paired curtains. Sometimes the cornice boxes were omitted to show the curtains on their track. Four-poster beds with plain curtains and a straight valance were a popular choice. Mass production was the norm. The improvements in printing and dyeing over the previous 70 years had led to increased production of cotton goods. The idea of offering patterns in several different colourways had first appeared around 1820 and had become usual. There was a vast array of brilliantly coloured all-over printed cottons, and one- and two-colour unglazed cottons became relatively cheap in Britain. During the 1840s there was a revival of interest in late 18th century designs. Victorian fabrics often had brown or black grounds and incorporated deep, rich colours in the design. From the middle of the century a number of new dyes were available for yellow, purple and blue-green. The specialist textile industry in Marseilles, badly affected by the cheaper cottons available, declined rapidly. In Britain, Jacquard looms produced an increasing amount of small-patterned wool damasks and moreen, a worsted cloth with a wood finish. Roller-printing grew, and soon dominated the textile industry, which used chemical dyes and a palette of colours inspired by Persian textiles. Floral prints on cottons or cretonnes were popular in Victorian bedrooms, tartan and paisley patterns were widely used and lace was everywhere. Chintz remained fashionable until the end of the century. William Morris was very interested in textile design and favoured hand-blocked printing. Influenced by medieval art and Islamic, Persian and Italian Renaissance textiles, Morris believed that motifs from nature could be flattened and stylised. There was a renewed interest in chinoiserie designs of peacocks and dragons, poppies, chrysanthemums and fruit trees in blossom. These fabrics were used to accompany the rich lacquerwork which was fashionable at this time. There was a vogue for all things Japanese following the reopening of Japanese ports of trade with the West in the 1890s. The Near East was also a major influence, with “Turkish corners” furnished with Near Eastern textiles such as ottoman velvets, prayer rugs and Turkish rugs covering cushions, window seats and divans. In France, tulle muslin and dentelle were used for romantic-style curtains and bed draperies. Silk and damask decorated with flowers and exotic foliage were popular; the large flower designs dictated the way the fabrics were used. Trimmings were rich and ornate. Braid was large and stylised with a variety of decorative motifs. Gimp braid with clusters of bobble fringe was fashionable. Fringes were usually deep and topped with braids bearing geometric patterns or appliquéd flowers. There were ornate bullion or ball fringes. Persian fringe had a wide border supporting “teardrops”. Tassel tops were arrow-head in shape or domed, with long skirts. Some tassels were severe and stylised, appliquéd with golden leaves or shells. Contrasting linings, corded edges, dark silk fringing, embroidered panels and trompe l’oeil valances were all features of this period, and bell pulls with braided edges, appliquéd centres and tassels were very fashionable. At the turn of the century, most households still favoured a traditional look, which could embrace a number of styles. Blinds were much in use, including festoon blinds in silk and roller blinds in linen union or Holland linen, often with lace insertions and sometimes printed with fashionable designs. The roller blinds were always fringed to match. Painted, stained or varnished Venetian blinds were another option. Exterior blinds were an important feature of the period and were available in a wide variety of styles. New novelty curtains were introduced and included a variety of nets, gauze frilled with point d’esprit, and panel curtains in Nottingham, Brussels or Swiss appliqué lace. The popular cottage-style window needed a different approach, and designers and department stores produced special materials and designs for the purpose. Goblet pleats remained a favourite heading. Festoon blinds were usually recommended for sash windows. A wide range of poles, rods and pelmet boxes were available, with the pelmet boxes usually painted white or stained mahogany, oak or walnut. During World War I there was a great shortage of materials, and a quieter style of curtaining emerged. Flower prints or glazed cottons were popular, and plain curtains were given a richer look in colour and fabric. Velvet, slub silks or brocades were used in yellowy gold, royal blue or wine red and swathed in the 19th century styles as an alternative to the pelmet boards or stiffened pelmets. Bungalows, cottages, and flats made simpler, less expensive treatments a necessity after the war. Curtained cupboards for bedrooms maximised space, and bedcovers and curtains were usually in a matching fabric. The 1920s and 1930s continued this pared-down look, with the most usual treatment being straight-hung paired curtains under a pelmet box. There were a few innovative ideas, such as a heraldic banner on a swing bracket. The portiere came back in to fashion and appeared in a variety of fabrics including tapestries, velvets, brocatelles, damasks, plush, chintz and taffeta. Appliqué in leather or embroidery on plain fabric was popular. Most curtains were straight and braided or bordered, but some unusual headings such as a chain pattern were fashionable. Beds were more stream-lined, and trimmings quite low-key. French-style drapery was very fashionable. Festoon valances on a plain lath, often with a goblet heading that pulled up on a cord, were a fashionable option. In the 1920s, early 18th century Spanish carved beds were a source of inspiration, while the 1930s and 1940s were swayed by Hollywood glamour, with buttoned headboards and silver satin bedspreads. New techniques, fibres and dyes revolutionised the textile industry in the early 20th century. The emphasis shifted to easy care and hygiene. Man-made fibres, where natural fibres are regenerated and chemically treated, were introduced, and proved resistant to shrinking and ceasing. Synthetic fibres, where were completely chemically derived, were developed as a cheaper substitute for natural fibres. Popular fabrics of the early 20th century included simplified versions of 18th century patterns, and designs based on 16th and 17th century needlework patterns. Plain fabrics were also popular in the 1930s. In the early part of the century, the French painter Raoul Dufy designed blockprinted textiles with geometric patterns inspired by Cubism, and by the 1930s many artist-inspired fabrics were on the market. Typical Art Deco motifs were bold and flat, the pattern flamboyant with sharp bursts of colour. Orange and black, and blue and gold were two of the most popular colour combinations. The Art Deco and Modernist styles demanded less ornamentation. Braids were straight with geometric motifs, and they became smaller and neater as the century progressed. Fan-edged gimps and picot braids with patterns of small loops were frequently used. Fringes were deep-headed, often with crochet work with long bunches of fringe for the skirt. Tassels were smaller, with cylindrical heads and the fringes corded. Sometimes the tassel head was made from cut-glass. Tie-backs often had superimposed chinoiserie motifs. World War II saw curtain and chair-cover materials rationed. Mattress ticking, duster material and dyed parachute silk were pressed into service as curtains. Countrified printed cottons with flowers and trellis were popular. Deep shades such as wine red, pine green and golden brown were the most successful dyes and went with the look that was then popular. Tie-backs were added when enough fabric was available. Department stores also began to offer ready-made curtains in the 1940s. There were no great innovations in curtain design in the 1950s and 1960s. Plain or shaped box pelmets combined with straight-hung curtains were the usual choice. Ready-made curtains, hemmed and headed with a gathered heading tape were an inexpensive option. Venetian blinds became fashionable again and were offered in an extensive colour range. A variety of other blinds were also introduced, including blackout blinds to help people sleep. By the 1970s drapery was once again fashionable as part of the English Country House neo-Edwardian/Victorian look. Curtains were made with much more material for a fuller look, and pelmets and valances were swagged, smocked, pleated and ruched, and decorated with fringes, rosettes and choux. Pull-up blinds, Austrian and festoon, enjoyed a renaissance. The Country House style has seen the revival of elaborate bed treatments, including the fully dressed full-tester, the half-tester and variations on the corona. French-style beds have enjoyed great popularity, sometimes featuring simple drapery trailing over the ends of the bed. Brass bedsteads and patchwork quilts are used in cottage style interiors, but the general trend is more streamlined, with the bed treated as an integral part of the scheme rather than as an eye-catching centrepiece. Simple weaves such as gingham and other utility fabrics were characteristic of the 1940s. Another legacy of the war was the use of restricted colour schemes in fabric design. The majority of designs produced in Britain at this time used no more than two or three colours on a neutral grey, white or black background. Needlework patterns of the 16th and 17th centuries were popular sources for designs for woven and printed textiles. The 1950s brought bold flowers, jazzy geometrics and abstract patterns. Science and technology were sources of inspiration. Smaller patterns worked well with the new sophisticated interiors of the 1960s. The clean, bright colours and simple, modern designs of Scandinavian fabrics became popular. Another influence came from art - pop art, op art and graphic design. Patterns by William Morris and other Arts and Crafts designers also became popular, in both Britain and America. As the Country House look took hold, the huge revival of chintzes of every sort began. Soft pastel designs gave the 1970s a fresh new look. Ethnic textiles were also characteristic of this decade, and were the small-scale prints popularised by Laura Ashley. In the 1980s, as a result of the Country House look, toiles de Jouy once again became popular, as did stripes, checks, plaids, ikat prints and weaves, and flamestitch prints and weaves. Innovations have included striking black-and-white architectural designs with Classical motifs, fabrics exhibiting dramatic colour combinations, and fabrics reflecting a broad range of historical and geographical reference. There is an enormous variety to choose from. The elaborately swagged curtains of the Country House look has been accompanied by deep bullion fringes, and braids and borders have been used on leading edges or inset into the curtains.